This car was about to land in the same “woof” category (for being slow as a dog), until a little online research yielded some interesting facts. First of all, this car was built in Canada, but not in Ontario near Michigan as you’d expect. It was built in Sainte-Thérèse, Quebec, so instead of angry union labor building your car, you had angry French-Canadian separatists doing the job. And in GM’s attempt to acknowledge the changing times, what with increasing oil prices and the greater influence of imports, they released their new 1978 model with a fastback body style, as well as an optional LF7 260 diesel V8 engine, bursting with 90 furious horsepower. They were furious because the engines were underdeveloped, and the diesel fuel at that time was of poor quality. 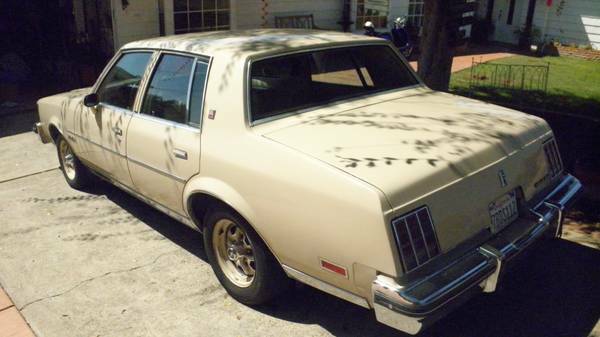 You can find this 1981 Oldsmobile Cutlass Diesel for sale in San Diego, CA for $3800, or $3200 if you can read Spanish. 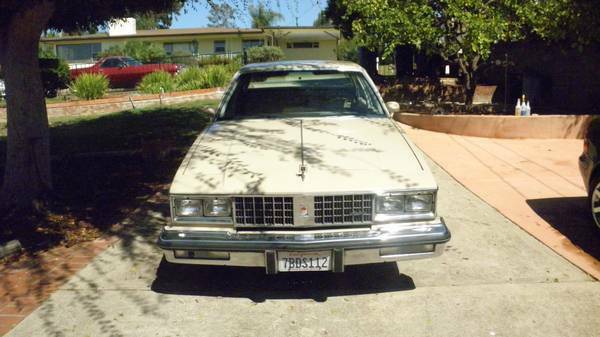 The car is in remarkably good condition for a throwaway 1980s GM sedan. Depending on the ad you read, it’s been stored for 14 or 18 years, but either way that’s definitely contributed to the cosmetic condition. And by 1981, Oldsmobile had upgraded to their LF9 350 diesel V8, which put out a measly 105hp, but a fairly respectable 205lb.-ft. of torque. The seller says the upper motor was rebuilt, which is presumably the head, and hopefully doesn’t mean the headgasket was blown. If it does, you’ll want to see proof it was properly done. GM’s diesels suffered in the period from their internals not being reinforced for diesel duty and lack of a water separator, and when they were rebuilt after the inevitable blown head gasket, that was not done properly either. 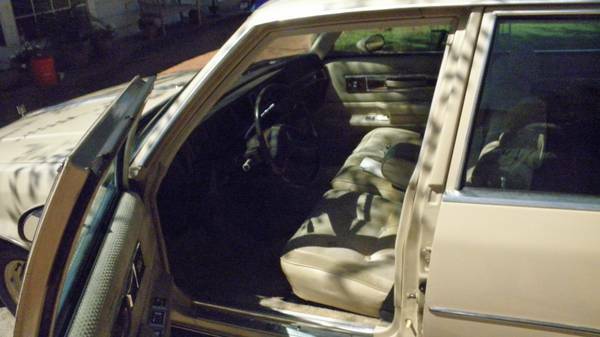 The interior is that typical seventies/eighties GM look, with tufted seat cushions and a very natural combination of velour, vinyl, and plastic. And you don’t even get the rouge-boudoir interior, but are instead treated to a lovely flesh-toned interior, keyed to the exterior color. So as you can see, there’s really not a whole lot to recommend these cars, except their oddball nature. Perhaps you always wanted to do a biodiesel conversion, but insist on buying American. Or perhaps you want to forget about diesel entirely, because older diesel cars are not subject to smog, and drop in some kind of insanely powerful V8 that will immediately overwhelm the rest of the car and send you into the nearest tree. Oh, and one last thing for Spanish readers – the seller helpfully points out that the shadows in the picture are from a tree! This entry was posted on November 17, 2013 at 5:00 am and is filed under Feature. You can follow any responses to this entry through the RSS 2.0 feed. You can leave a response, or trackback from your own site. We use to swap junkyard Olds gasoline engines into these way back in the day and re-sell them for a tidy profit; it was a fairly straightforward task that could be accomplished in a day or two. Olds V8 are a lot harder to come by these days though, and besides I don’t see any profit to be had here.